Discussion in 'MacBook' started by Joshpho, Aug 17, 2011. I'm not exactly clear on how to interpret these results, but I believe it's saying that the battery doesn't have any capacity for charging. Will buying a new battery solve the problem? 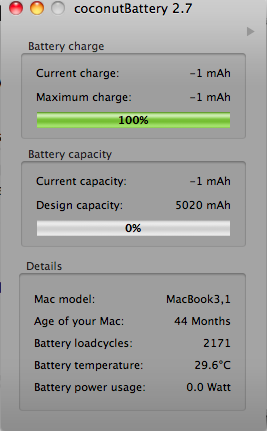 I'm not sure if Apple sells the batteries for the older Macbooks now, either. By that, it looks like your battery is toast. I'd get a new one. You can find cheaper ones online. Okay, thanks. Can you recommend any sites to buy one from? Check Amazon. I'm sure they have some for less than what Apple would charge, but off-brand. Reset the SMC is about the first thing to do with battery issues.